Nagoya is one of the largest cities in Japan and has its own food culture and attractions. This article helps you compare methods of traveling between Tokyo and Nagoya with consideration to price, time and convenience. "I would love to visit as many places as possible." Every single traveler probably feels like this. Nagoya, one of the largest cities in Japan, has many sightseeing placet. We will introduce four ways to travel between Tokyo and Nagoya and compare them from the point of view of price, time and convenience. Trains in Japan have a good reputation among people all around the world. The Shinkansen (bullet train) runs from early morning. It costs 10,000 to 15,000 yen (one way) to reach Nagoya from Tokyo. The ride takes about 2 hours. It is easy to plan your time out since there are many Shinkansen between Tokyo and Nagoya every day. Seats are really comfortable and you won't get tired sitting. Moreover, it is easy for you to get anywhere you want in Nagoya from Nagoya station. It is more expensive than taking other kinds of transportation. But it is worth spending this amount of money if you take into consideration the travel time and the convenience. 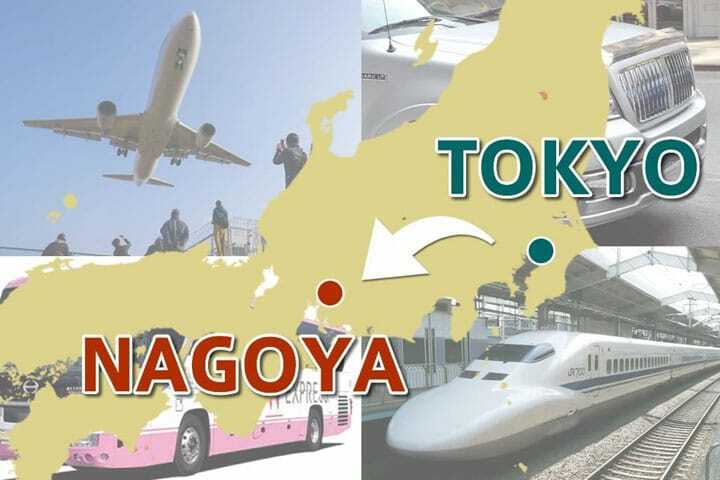 A one way trip between Tokyo and Nagoya costs from 7,000 to 25,000 yen. If you book a flight early enough, the price might come out cheaper than Shinkansen. It takes only one hour to Nagoya after boarding the flight. So if you don't like staying in the same position for a long time, it will be the best option for you. But if you consider the time of waiting for the airplane at the airport and traveling between the airport and the center in the two cities, it will take you longer and cost more than the Shinkansen in total. There are only 3 flights per day from Haneda airport to the Chūbu Centrair International Airport. So you might need to arrange your plans depending on the flight schedule. Image from Japan Bus Pass: Unlimited Rides on High-Way Busses Around Japan! Taking a highway bus between the two cities costs 2,000 to 8,000 yen. So this is the least expensive way to travel between Tokyo and Nagoya. The highway bus terminus in Nagoya is Nagoya station which is convenient to go anywhere you want after arriving in Nagoya. Highway buses usually run during the night. You can use your sleeping time to move from one city to another which also means that you can save up the money you would have spent on accommodation. It takes from 5 to 7 hours to reach Nagoya. You might think you will feel cramped on the bus. But there are buses which have wider seats these days. Besides, some of the bus companies provide you with a blanket, a small pillow for your head and back, slippers and other items. It is a long ride so if you are the person who easily gets carsick, please take medicine. Renting a car and driving down on the Tōmei Expressway is also an option. It costs you 4,980 to 7,110 yen to take this highway. In addition, you need to pay for accommodation and fuel. If you have other people coming with you, it cost less than any other ways. It takes about 4 to 6 hours to reach Nagoya. The best thing about renting a car is being free to go anywhere you want. If there are other people who can drive, you can take turns to drive which will be less stress for drivers. But you need to take the risk of being stuck in traffic or getting lost. Please enjoy your journey between Tokyo and Nagoya as you choose the best way to travel according to your preferences and schedule.